New CAP Maquettes has selected with care a wide range of fine synthetic brushes to paint your models. Round, flat brushes, liner brushes or Spalter brushes. 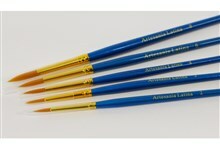 They are suitable for oil and acrylic paints. The Taklon fibers are flexible and thin. That will allow a perfect finish on your model boats and figures.